Peppa Pig Inflatable Flocked Chair. Stylish Inflatable Easy Chair With Non Slip Suede Surface. For Indoor Or Outdoor Use. Get comfy with Peppa and Friends. Styles may vary. Rapid inflation and deflation makes it easy to get comfy with friends in her very own chill chair. For ages 18 months and over. Design may vary. Floating bean bag for lazy afternoons spent in the pool. 1 x Floating Chair(Beans not included). Filing Capacity 500-550L of Beans (not included). Colour: Blue. -- Outer cover can be replaced or washed. Material: PVC: AdultsType: Inflatable sofa. Sofa Air Soccer Football Self Bean Bag Chair. Get comfy with Peppa and Friends. Styles may vary. Rapid inflation and deflation makes it easy to get comfy with friends in her very own chill chair. Ottoman 25" x 11" (64cm x 28cm). Size(Inflated):Chair 41" x 43" x 28"(104cm x 109cm x 71cm). Colour:Orange&White. Ideal for Indoor an Outdoor,Camping,Gamingetc. Compactly fold for easy storage. Get comfy with Peppa and Friends. Styles may vary. Rapid inflation and deflation makes it easy to get comfy with friends in her very own chill chair. Keep away from fire. 1pcs Inflatable Couch Bean Bag Air Chair. Max last for 120 hrs. Note: Light shooting and different displays may cause the color of the item in the picture a little different from the real thing. Capacity: 175 lbs (80kg). BEAN BAG COVER ONLY WITHOUT BEANS. Simple, Affordable, Stylish Bean Bags Covers. Flexible And Moulds To Adjust To The Shape Of The User's Body, High Back Support And Is Light Weighted. 1 x Inflatable Sofa. 1 x Inflatable Chair(the inflating tool is not included). Provide you a comfortable chair to have a rest, work or chat with your friends. We will try our best to reduce the risk of the custom duties. 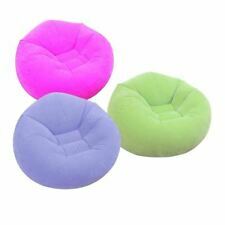 INFLATABLE BEAN BAG FLOCKED POUF INTEX ASSORTED COLORS. Bag armchair 107x104x69 cm, available in 3 assorted colors, lilac, green, pink, easily foldable, made of flocked material, comfortable and comfortable. Inflatable chair football design, robust, pre tested vinyl. Uncomplicated Checkout. Smoke Detector. Top Products. Top Categories. Muster Sportmotive. EAN 6942138970043. Marke Bestway®. ABOUT THIS PRODUCT Get comfy with Peppa and Friends. The chair has been designed with an inflatable inner and soft flocked seat so your little one can sit and watch your favourite Peppa programme in style. Plus, you can pop it up in seconds - simply inflate by blowing or using a pump, and deflate easily to store away after play. Styles may vary. Rapid inflation and deflation makes it easy to get comfy with friends in her very own chill chair. Made from PVC. Size H44, W45, D40cm. Design may vary. For ages 18 months and over. Warning! Keep away from fire. EAN: 5013138650806. ---One Person Inflatable Chair Ottoman ---Drink holder in one arm of chair ---Chair Measures - W 102cm x L 127cm x H 76cm (40in x 50in x 30in) ---Ottoman Measures - W 64cm x H 28cm (25in x 11in) ---This item requires an inflation device which is not supplied but is available separately. --- A modern and stylish inflatable chair. This chair has a loose footstool that can be place at any desired distance. The combination of a footstool, a soft top layer and the specially formed back rest provide a comfortable seat. Compact to carry. Note: To prevent from bursting, it’s important not to inflate this product too full, or use high pressure air compressor. And in order to avoid leaking, it’s important to put the product on clean flat level floor, do not put them over sharp objects. Color: green Material: PVC flocking Max last for 120 hrs Diameter: 55cm Height: 30cm Capacity: 175 lbs (80kg) Package includes: 1pcs Inflatable Couch Bean Bag Air Cube Chair Only the above package content, other products are not included. Note: Light shooting and different displays may cause the color of the item in the picture a little different from the real thing. 1pcs Inflatable Couch Bean Bag Air Chair. 1X(Color: green. Note: Light shooting and different displays may cause the color of the item in the picture a little different from the real thing. Capacity: 175 lbs (80kg). ). 1pcs Inflatable Couch Bean Bag Air Chair. Note: Light shooting and different displays may cause the color of the item in the picture a little different from the real thing. Capacity: 175 lbs (80kg). Color: green. 1pcs Inflatable Couch Bean Bag Air Chair. Note: Light shooting and different displays may cause the color of the item in the picture a little different from the real thing. Capacity: 175 lbs (80kg). Max last for 120 hrs. Color: green Material: PVC flocking Max last for 120 hrs Diameter: 55cm Height: 30cm Capacity: 175 lbs (80kg) Package includes: 1pcs Inflatable Couch Bean Bag Air Chair Only the above package content, other products are not included. Note: Light shooting and different displays may cause the color of the item in the picture a little different from the real thing.